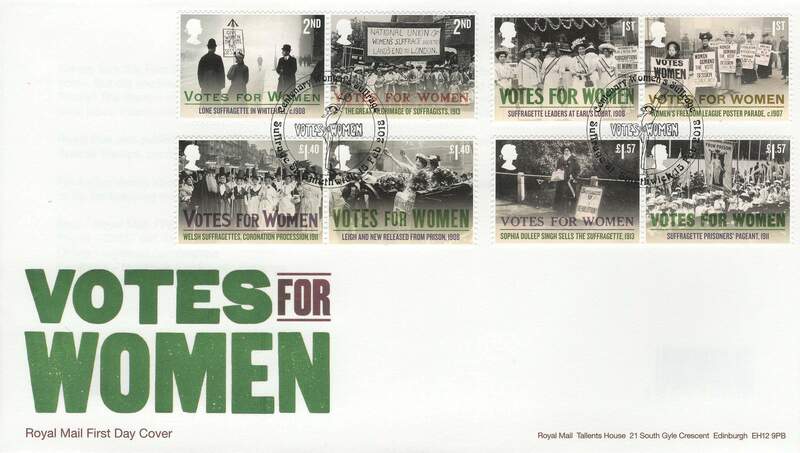 This February sees the release of a set of eight stamps commemorating the centenary of women being granted the vote. It seems strange now to think that at one time women didn’t have the right to vote and the set celebrates the deeds of those women who fought for this basic right. One of the campaigners was Mary Wollstonecraft, the founder of feminism. A philosopher, travel writer, human rights activist, she was a profound influence on the Romantics, and an educational pioneer. Wollstonecraft was born in 1759 into a picturesquely bleak family. She had a violent alcoholic father, and a weak, unsympathetic mother. Despite her inauspicious beginnings, she dragged herself upwards, eventually becoming a self-supporting bestselling international human-rights celebrity. Wollstonecraft argued, apparently outrageously, that women were capable of reason – all they lacked was education. An early role model, she translated and reviewed essays on natural history, and she was speaking the language of human rights before the term existed. She didn’t exclude men, or indeed anyone. 2nd Class: The Lone Suffragette in Whitehall, c.1908 A suffragette demonstrates in Whitehall, circa 1908, walking in the road because people were not permitted to protest on pavements and faced being arrested for obstruction if caught. Her placard demands that Parliament give the vote to women during the current session. The convict’s arrow that surmounts the sign may indicate she had been to prison. 2nd Class: The Great Pilgrimage of Suffragists, 1913 In summer 1913, the NUWSS organised a pilgrimage to show the Government, via non-militant action, the strength of its demand for ‘votes for women’. Starting on 18th June, the South Western, West of England and Surrey, Sussex and Hants Federation travelled from Land’s End to London. Around 50,000 women gathered in Hyde Park on 26th July. 1st Class: Suffragette Leaders at Earl’s Court, 1908 On 25th July 1908, the WSPU was given permission to hold a demonstration and fete within the Hungarian Exhibition at Earl’s Court in London. Wearing their ‘Votes for Women’ sashes, four WSPU leaders (from second left to right: Mabel Tuke, Christabel Pankhurst, Emmeline Pethick-Lawrence and Annie Kenney) pose in front of one of the stalls. 1st Class: Women’s Freedom League Poster Parade, c.1907 Formed in 1907, the WFL organised this poster parade to promote the suffrage message. At the beginning of the 20th century, it was undoubtedly something of an ordeal for women to be walking in the gutter, bearing a placard, while surrounded by curious onlookers, As time passed by, however, they soon became accustomed to it. £1.40: Welsh Suffragettes, Coronation Procession, 1911 For the suffrage ‘Coronation Procession’, which took place in the London on 17th June 1911, Welsh suffragettes and suffragists put aside political differences to march together, each carrying a red Welsh-dragon standard. Many had made their own costumes; some using purple, white and green material, which were topped by the traditional Welsh hat. 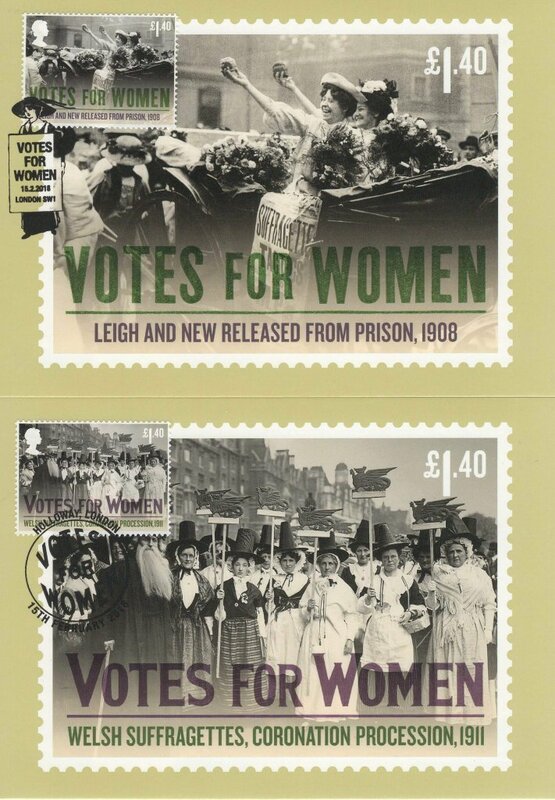 £1.40: Leigh and New Released from Prison, 1908 WSPU members Mary Leigh and Edith New were freed from Holloway Prison in London on 22nd August 1908 and were presented with purple, white and green bouquets. Imprisoned for throwing stones at 10 Downing Street, they were the first suffragettes to demonstrate what Emmeline Pankhurst called ‘the argument of the broken window pane’. £1.57: Sophia Duleep Singh sells the Suffragette, 1913 Princess Sophia Duleep Singh, daughter of an Indian maharaja, is pictured selling copies of the WSPU newspaper The Suffragette in April 1913. A member of the Women’s Tax Resistance League (whose official motto was ‘No Taxation Without Representation’), the princess appeared in court on several occasions after refusing to pay taxes. £1.57: Suffragette Prisoners’ Pageant, 1911 The ‘Prisoners’ Pageant’ was a striking element of the suffrage ‘Coronation Procession’ in 1911. Seven hundred women participated, representing the number of suffragettes who had been jailed. Dressed in white, they carried silver lances from which pennants were flown. The ‘From Prison to Citizenship’ banner symbolised their determination. The first petition from a woman asking for the parliamentary vote was presented in Parliament in 1832 by a wealthy Yorkshire woman, Mary Smith. The first suffrage campaigning committee was set up in Manchester in late 1865. Mary Wollstonecraft was married to anarchist philosopher William Godwin, and gave birth to the renowned author, Mary Shelley. 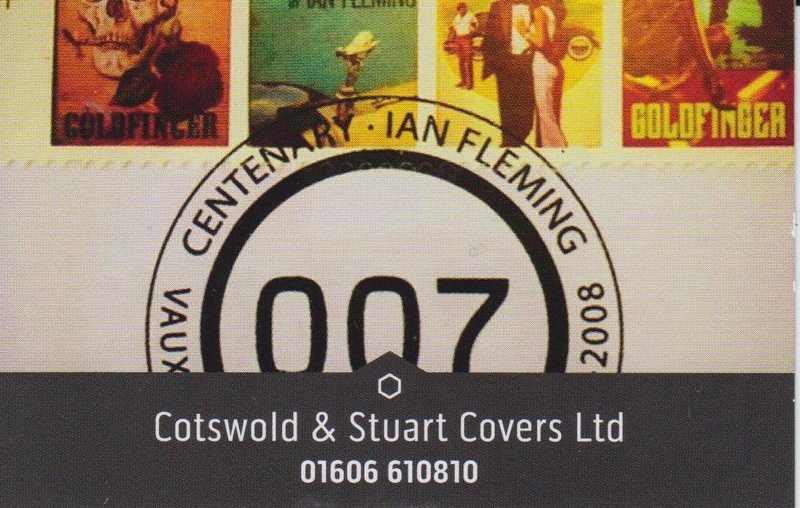 RAF Centenary stamps and Red Arrows too!